No trip to Prague would be complete without a trip to the city’s main square, or Staroměstské náměstí. Here you’ll find the ancient Astronomical Clock, built over 600 years ago and officially the third oldest in the world. Every hour, join the tourist crowds as they watch the impressive mechanical performance, which was quite the show back in the Middle Ages. Witness a procession of Apostles, moving statues and chiming acoustics. The city’s Old Town Hall, constructed in 1338, is another highlight here. For a small fee, you can climb to the top of the building’s towers for striking views over the Old Town and the city’s sprawl of red rooftops. 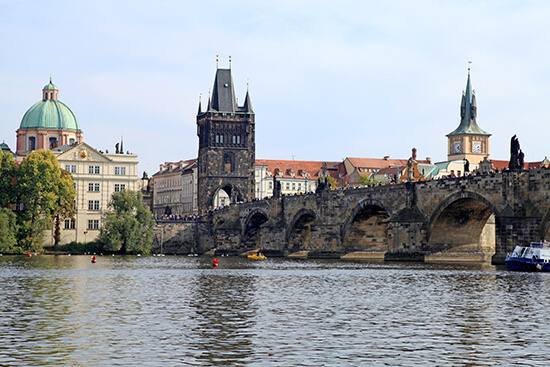 The Charles Bridge is undoubtedly one of the most iconic images of Prague, however, it’s also one of the most popular sights too. To keep your crossing crowd-free, visit the bridge at dawn. You’ll miss the hawkers and most of the tourists, and you’ll enjoy misty sunrises over the Vltava river. Alternatively, a nighttime stroll will be shared with the crowds but offers beautiful views along the riverside. Prague Castle is not like the rustic, rugged castles you’ll find perched on hilltops across the UK; usually located in the coldest, wettest and windiest settings. This grand palace complex is something else entirely (although it’s just as old with structures dating back to the 9th Century). Allegedly the largest ancient castle in the world, the site sprawls a grand 70,000m2. Today you’ll find a regal site to explore, presenting a bold range of architectural styles, fancy interior furnishings and a wealth of artworks. Don’t miss the impressive late-Gothic vaulted ceiling in the Vladislav Hall. Trek to the top of Petrin Hill and you’ll uncover not only the best views of the city but a few alternative views of yourself. Start by walking up the small-ish hill on foot; the panoramas are more rewarding if you’ve worked up a sweat. Then climb the Petrin Lookout Tower (a miniature version of the Eiffel Tower at only 62m high) for arguably the best views of the city. Climb the 299 steps for a bit more exercise or take the lift for an easy ride. On clear days you can see as far as Central Bohemia. Once back down to earth, stop by the mirror maze. I know it sounds childish but hear me out. This place is home to endless hours of fun, if you’re travelling with the right type of people. Escape the labyrinth of reflections before stumbling into a room of distorted mirrors, which is based on the Hall of Mirrors at Prater in Vienna. People often assume Eastern European dishes are heavy, stodgy and flavourless. Their loss. Prague is packed with places to eat from the hip to the high-end. The café culture here is seriously cool: try Můj šálek kávy for breakfast, where you’ll find rich, intense coffees, hearty breakfasts and cream-slathered cakes for dessert. It’s a good place to hang out with the locals too. For a more luxurious affair, try Nostress for an evening meal. The atmosphere is sultry and romantic, while food on offer is delicious. 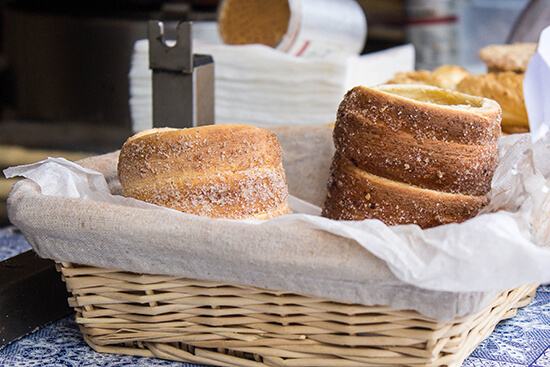 When you need a snack, head to Creperie U Kajetána for a traditional trdelnik, a sweet pastry dough rolled around a stick and grilled to perfection. Eat it hot, with a slathering of Nutella or sprinkling of sugar to finish. So once you’ve had your fill of food, what next? On to check out the city’s nightlife, of course. Many a tourist associate Prague with cheap stag and hen parties but, if you know where to go, you can find alternative and unique bars to frequent. Start in AnonymouS Bar. Located among the Old Town’s narrow backstreets and alleyways, it’s a little tricky finding it, but worth it once you’re there. Here, you’ll meet masked barmen (think the world-famous V for Vendetta face) and have the chance to uncover secret menus. I’d share the most creative cocktails on offer but it’s more fun keeping them a mystery. Trust me, they each have their own kick and will get your night started. If you’re looking for a uptempo night out, head north across the river to the city’s collection of local clubs. There’s a more gritty feel here (think Hackney or Brixton) but you’ll get a more authentic evening. 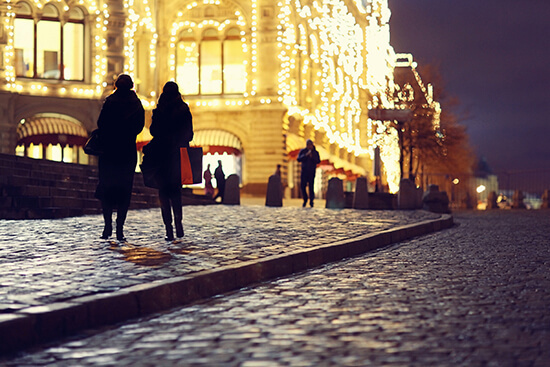 When you think of Prague, shopping doesn’t instantly spring to mind. However, the city’s Jewish district (north of the Old Town) has streets lined with beautiful boutiques and shops galore. For luxury brands in elegant Art Noveau buildings, meander down Pařížská Street, which runs from the Čechův Bridge to the Old Town Square. Here you’ll find world-famous fashion houses, jewellery, cosmetics and more. For souvenirs of the more touristy-style, opt for smaller stores around the Old Town. 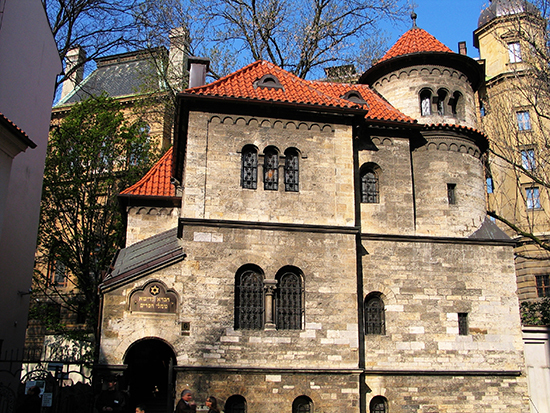 Like many cities across Eastern Europe, Prague has had a dramatic history. Take the time to learn its story from its conception through to the events of the 20th century. Both the Jewish Museum and Museum of the Ghetto offer a chilling insight into the events surrounding World War II. For the artistic travellers among us, head for Sternberg Palace or Veletrzní Palác (Trade Fair Palace). Both are home to impressive collections of Czech and European artworks, including works from Kilm, Munch, Rembrandt and more. 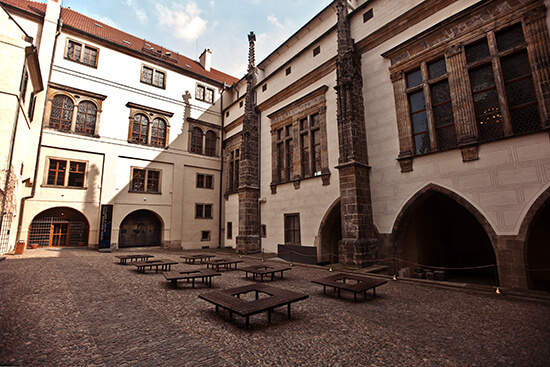 Other interesting stops include the Franz Kafka Museum, the Czech Beer Museum and the National Technical Museum. Prague is a small city and easy to get around on foot. The Old Town, Jewish Quarter and most of the touristy highlights are all within walking distance of each other. If you’re heading north of the river, to dip your toe in the local nightclub scene, take a taxi and agree on a price before setting off. If you’re staying outside of the centre, there are trams, the Metro and an extensive bus network available. 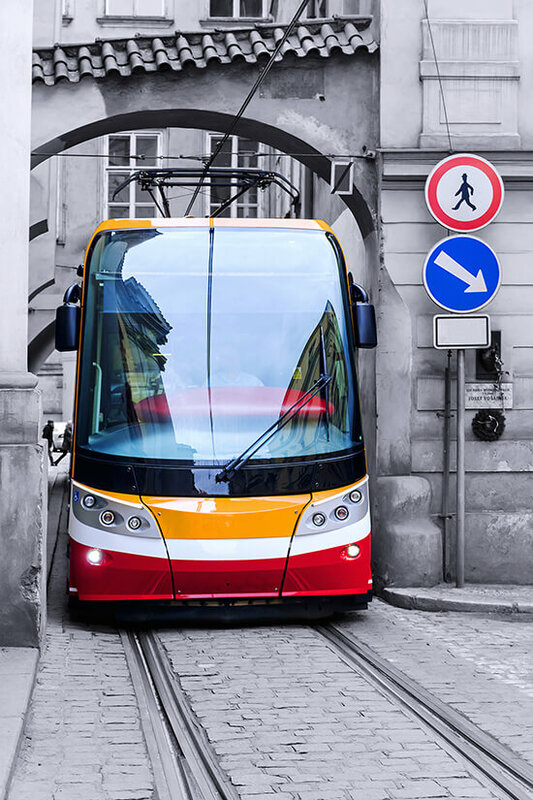 Trams often offer the fastest, easiest way to travel around. Save the Metro for longer distances. The buses are a good go-between the airport and city centre. Don’t forget to validate your ticket in the yellow machines, once you’ve joined a bus or tram. Many travellers have been caught out with this one. 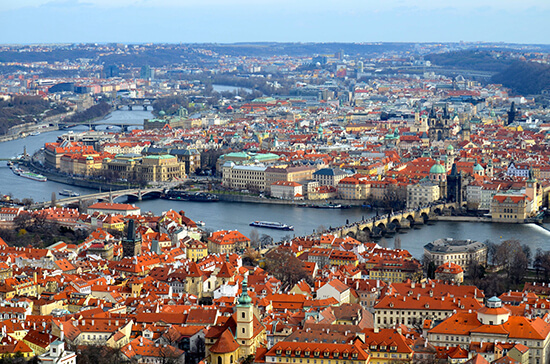 Prague is a fantastic year-round destination. The different seasons bring different highlights to a trip. Visiting in the winter months offers charming Christmas markets in crisp, icy weather, and maybe even snow. The summer brings glorious sunshine where the city’s parks burst with life and offer a relaxing retreat. To avoid the crowds, visit in early spring or autumn (think April or September), when the weather is fine and the crowds few and far between. Inspired to book your European city break? Book an appointment with one of our Travel Experts today and they'll create the perfect Prague trip for you.